I'm using Team Foundation Server 2008 (SP 1) and I need to move multiple files from one folder to another (to retain file history). In addition to Team Explorer (with SP 1) I've also got the latest TFS Power Tools (October 2008) installed (for Windows Shell integration). Now, the problem is that I can't seem to select and move multiple files via either the shell or the Source Control Explorer window. 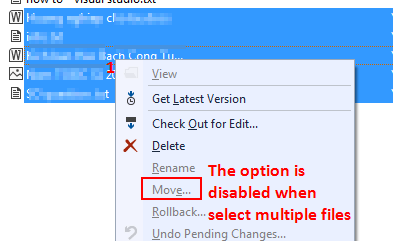 I can move individual files (by right clicking + "Move") and I can move whole folders (same operation) but when I select multiple files (in a folder) the "Move" context item is grayed/disabled. Does anyone know if this is possible.. and if not.. why not!? Can anyone suggest a workaround which isn't overly complicated? tf.exe move "$/My Project/V*" "$/My Project/Archive"
[EDIT] As noted in the comments: move is an alias for rename. Both commands move history. 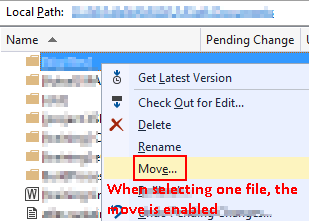 Holan Jan has written a Visual Studio Extension which provides 'move' for multiple files within source control explorer (i.e. using a GUI) Works a treat, also has support for recent versions. Under the hood it does use the same commands mentioned above but it's just a bit friendlier to use. Stick all the files that you wish to move, under a folder and then move that folder. Not the answer you're looking for? Browse other questions tagged version-control tfs tfs2008 or ask your own question. How should I move one of the DB project schemes into its own solution in TFS?